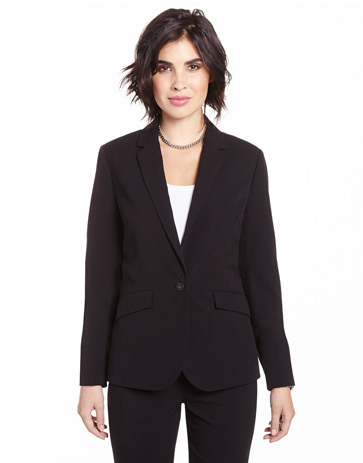 Be professional and stylish in this Willow & Thread printed blazer. Featuring a beautiful spring print, pockets and a contrasting button, it will add a little something in your 9 to 5 wardrobe. Pair it with tailored pants for an effortless week look. The blazer is excellent quality. The fabric is soft and stretchy. Great fit. You do have to like bright colours. Very good quality and perfect fit! Thank you! Nice jacket, super fit, nice cut, very versatile. awkward fit, small through shoulders, too big thru bust & waist. very disappointed with item. You could wear this blazer with lots of different colors and with jeans, dress pants, capris, skis, skirts and even dresses.